In an online world where anonymous friends came together to share an interest for gaming, a couple thought their virtual social life was safe. 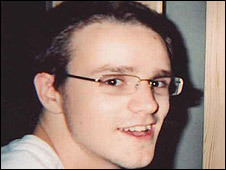 But when German David Heiss, 21, carried out a frenzied and fatal attack on Nottingham student Matthew Pyke, 20, that virtual world was ripped apart. Heiss was convicted of murder at Nottingham Crown Court after stalking Mr Pyke and Joanna Witton, his girlfriend, for six months. The German was given a life sentence for what was described as "a savage attack". The court heard how Heiss became obsessed with Miss Witton, through gaming forum warcentral.com and began a mission to "erase" her boyfriend. Miss Witton, from Selby in North Yorkshire, and Mr Pyke, originally from Stowmarket in Suffolk, were running warcentral.com, an online discussion forum, when Heiss first made contact with Miss Witton. Over the course of six months, cyber onlookers witnessed Heiss's infatuation becoming ever more sinister, the court was told. Heiss, who used the alias Eagle The Lightening (ETL), had read Ms Witton's online journal. He looked at her photographs on social networking website Facebook and, in March 2008, contacted her saying he had a crush on her. Ms Witton politely declined his affections, but in June he turned up at the flat she shared with Mr Pyke, unannounced, having told friends online "I need to see her". Recalling her horror when she saw Heiss standing outside her flat on North Sherwood Street in Nottingham, Miss Witton said: "He went, 'it's me, ETL, off the internet'. "It terrified me. I went to the toilet and just cried." Heiss stayed in England on that first visit for almost a month before returning home to Limburg, near Frankfurt. In that time he stalked Ms Witton, waited for her to finish work and left love notes at her flat. The court heard how gamers on the site fuelled arguments between Heiss and Mr Pyke, by revealing negative comments each had said about the other. Heiss's obsessions deepened and witness and fellow forum member, David Quinn, 19, told the jury how Heiss had told him the situation would end in one of the three dying. In continued online messages, Heiss told Ms Witton he would come to Nottingham and stab himself in front of her if she carried out her threat of preventing him from making contact. She told the jury: "People throw threats across the internet all the time, you don't take them seriously." The court was given an insight into a world where people from all over the world "chatted" via the internet and conducted an alternative life online. Miss Witton (alias Jojo) met Mr Pyke (alias Shade) on the internet in 2005 and she said their entire social life was conducted online. "We did not go out because we did not want to get into trouble in the city centre," she said. Mr Pyke listed 19 things online that he hated his girlfriend's stalker which prompted a virtual argument between Mr Pyke and Heiss. In it, Mr Heiss told witness Mr Quinn online: "I'm feeling a strong desire to grab his head (Mr Pyke) and smash it against a wall several times. "I could - I could drive to Nottingham, I will." And he did - on a second visit to England in August 2008 in an attempt to make further contact with Miss Witton. However, again his advances were rejected. Heiss meticulously planned his third - and the fatal - trip to England in September 2008. He prepared an alibi, forged a suicide letter from Mr Pyke and gave himself just 16 hours to carry out his brutal crime. On the morning after the couple's third anniversary celebrations, Heiss watched Joanna Witton leave for work and he stabbed the man she said she had planned to marry. Heiss used a knife he bought in Frankfurt to inflict 86 wounds on Mr Pyke. Two stone lighter than Heiss and wearing just his dressing gown and boxer shorts, Matthew Pyke was defenceless, the court heard. As he lay dying, he used his own blood to write the name of the man whose online obsession became a real life murder on a computer monitor.